Power2Drive Europe is the international platform for the energy transition in the transportation sector. This trade exhibition for charging infrastructure and e-mobility focuses on solutions and technologies for the environmentally friendly mobility of the future. 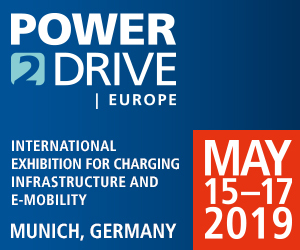 Power2Drive Europe will take place together with the energy exhibitions Intersolar Europe, ees Europe and EM-Power, which are all held under the umbrella of The smarter E Europe.